-Dremel. It does so much. Cutting, grinding, buffing, drilling. -Screwdrivers, to include a small tipped set for the tiny bits. -Wrenches, ratchets and sockets. They don't just go on your costume. -Utility scissors. Don't use your hair cutting scissors. -Rivet setter. A good way to join leather. 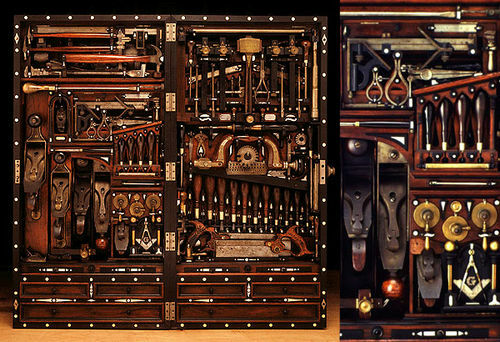 -Sewing kit, to include a set of stout needles and awl. -Hot glue gun. Mmmm. Spider silk like strings of hot glue. -Paint brushes. They don't have to be the pricey ones made of unicorn hair. -Measure tapes and rulers. A tailor's tape has many measuring uses. -Hacksaw. Because Rub n Buff turns PVC pipe into metal pipe. -Gloves. Easier and less painful than scrubbing your skin off afterwards. -Pliers. You can pick, pull, and crush anything with the right pliers. -Vise. Because sometimes you need a steady and strong third hand. What else? I know there is everyone from the crafters to the heavy constructors here. Possibly a saw and an axe. 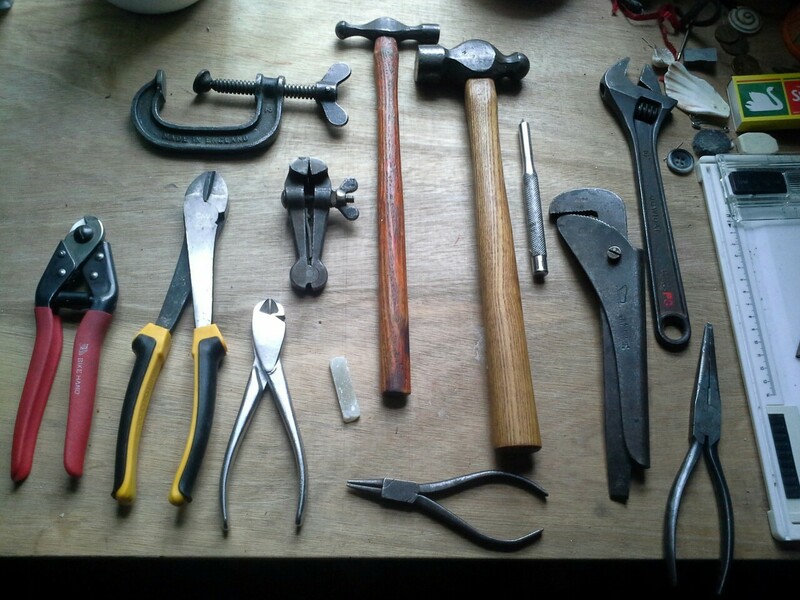 After that, ever other tool is just a short cut to what can be made with the tools I listed. I do like my Leatherman multi-tools. I've a Wave and a Juice. There are a few other brands floating around here, too. The little Cabelas branded mini-tool is a value above its price. 3D printer (or printing service). Sand/Emery paper - Keying and sharp bits. Epoxy filler - For smooth joins and fake welds. grey primer - for applying and sanding. Sculpting tools - a multipack of cheap ones plus more expensive metal and plastic probes, blades and the inevitable selection of found tools consisting of bits of plastic, metal, old jewelry etc. It is all about what material you are working. I used to braze repair steel lawn equipment, and learned how to stick weld well enough for my needs. It's been a long time, and grandpa's gear was inherited by other family members. I've a mini oxy and mapp gas set. It's supposed to be for brazing and light cutting. It'll braze, with some effort and finese, but it doesn't cut anything. Braze could be useful for Steampunk arts and crafts. Any ideas on a good, compact, inexpensive gas set up? I use a small Victor torch set with O2 and acetylene. Heating, cutting and brazing all very doable. Ah, yes. A rubber mallet. Because a framing hammer isn't for everything. Rawhide mallets are good, too. They even look kind of Steampunk. Your reply has also given me an idea to dress the hole for the hanger on my gun belt with a brass grommet. That'll give it a clean look. Victor seems to be the go to brand in torches. So much that other brands describe their offerings as "Victor style". Infinity of screws and plethora of small metal doo-hickeys such as washers, hinges, etc. I'd have to say that the first tool to use is your imagination, after all with no idea of what you're going to build, how can you build it? After that comes drafting: C.A.D. / Paper and pencil (with appropriate tools - rulers, setsquares, protractors, French curves and the like). Mock ups follow next Cardboard Aided Design is one of my faves! then comes building - gathering/sourcing materials, dry fits, swearing, endless cups of tea! "wood butchers" hammer - for nails/tacks etc. Rawhide/copper mallet - for those "Gentle" boshing jobs. Files: no not the Manila type, but everything from harsh rasps to fine needle files. Spanners, open ended, combination, ratchets, nut runners and the ever so present adjustable type. Allen keys both in metric and imperial. Pliers; all kinds, circilp, needle nosed, jewellers big ones, pipe grips. Saws: wood butchery ones, hacksaws, fretsaws. Screwdrivers a plethora of pozi, torx and flat in all manner of sizes. Finishing products: fillers, scrapers, sandpaper, paints and brushes, letraset, varnishes and dopes. Lathes, mills, drills, welding plant, blacksmiths forge, and a foundry, compressors, sandblasting booth etc. I suppose it comes down to what you work with IE: my list will be utterly useless if I were to undertake a project that involved fabrics and sewing, but it'd be useful for most other applications, but without that first creative spark its all just "stuff" we have lying around! Some of these I have - will have to think about everything else I use. Bought myself the Dremel workstation for Christmas!! These come with a wide variety of handpieces but the standard one has a tiny Jacobs chuck at the business end in place of the collets used with the Dremel. The Foredom can thus take every size of small drill bit down to a No.80, dental burrs, etc. Everything that will fit into a Dremel will also fit a Foredom. I have both; I find that if you can bring the work to the tool then the Foredom is superior, but if you have to take the tool to the work then a cordless Dremel is best. Also, if you have a lathe, the shanks of larger drill bits can be turned down to fit the Foredom chuck - though I don't recommend doing this with anything bigger than about a quarter inch or 6mm. Cordless drill with a range of screwdriver bits; flat, Phillips, Robertson (standard in Canada), hexagon, Torx, and sockets. Get one with two battery packs so that one can be charging while you use the other. You can never have too many clamps, from monster bar clamps, for example for clamping table tops together while glueing, down to mini plastic and metal clamps for finer work. Also, ordinary wooden or plastic domestic clothes pins make good clamps for jewellery and modelmaking, and can be shaped for special purposes. Air tools; nailers, staplers, impact drivers, sanders, grinders, air hammers (like a mini jackhammer, for cutting through concrete, bricks, tarmac). An air compressor to go with them, of course. Also good for spray painting. A soldering gun rather than a soldering iron; heats up in seconds when you want to use it, but stays cool and doesn't use any power when not in use. And good lighting. I have fluorescents for general shop illumination, with gooseneck type desk lamps to get plenty of light right down where I need it. Don't forget things like. Face shields, dust/fume masks, safety glasses, gloves, aprons, etc. Very valuable if you want to make more than that one piece. Oh, we are so glad to have a proper work table again. Most definitely. Some secondary lighting is still needed. And yes on the PPE. Work safe! I think I missed the point of this thread. I didn't list all my tool must-haves, just the ones I hadn't seen mentioned yet. Safety equipment to be sure. I wear an apron and thin nitrile gloves even when simply cutting, gluing, or painting. And a NIOSH- or equivalent-approved respirator is a wise and inexpensive protection. Without that, the rest are useless.....! My 'Dremel' isn't a branded 'Dremel' - it's a GMC, and I also have a mini version, for which I received some micro drill bits last week. Safety is also a given. Was a fully-trained up HSR when at work, which carries over into all 'domestic' operations. I'm not a brand snob, but I do like me some Craftsman. Affordable quality.